Our Calligraphy Dance Duffel features a brilliantly applied rhinestone design with “Dance” in calligraphy text using crystal and hot pink rhinestones. 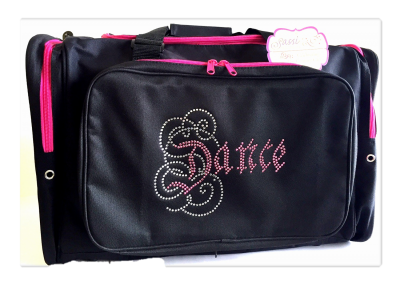 This bag is loaded with features such as large end pockets, front pouch that zips off and more! 600D polyester material wipes clean with a damp cloth. Can be personalized.